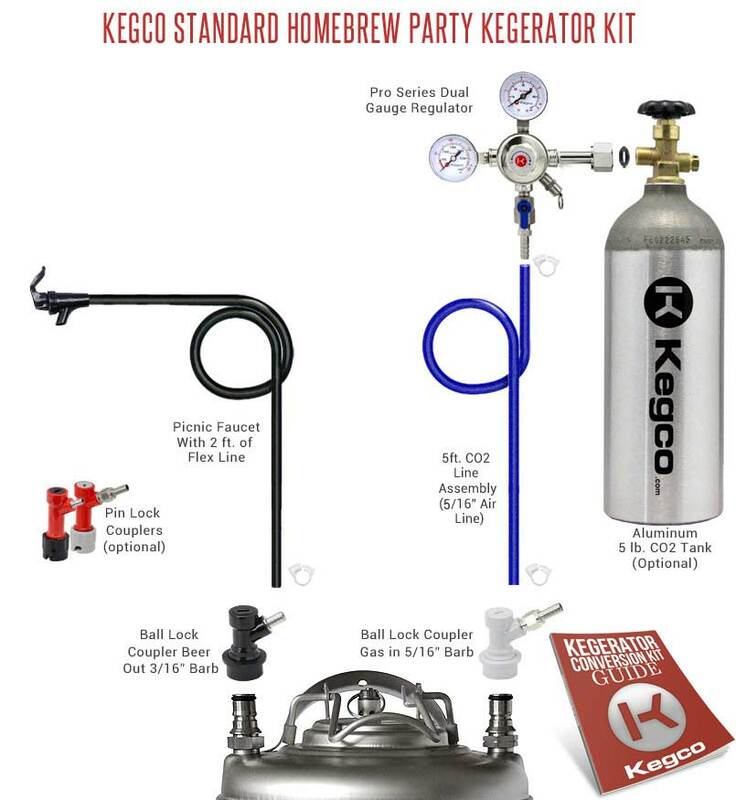 The Kegco SHPK Standard Homebrew Party Kegerator Kit works great as a party pump for a one night event when the keg is on ice, or it can be a fast and easy solution to having a kegerator in your home without having to drill through your refrigerator. As a party solution, it is superior to keg pumps in that you no longer have to pump the keg by hand. Gone are the days of having to hold your cup and the faucet in one hand while pumping with the other. Simply grab your cup and pour! As a kegerator, there are no shanks or towers to be installed with this configuration. All you have to do is have a refrigerator large enough to hold a full size keg. Your beer will not go flat if you cannot drink it all in one night. The Standard Kit is different than the Economy Kit in that it has a Double Gauge regulator, which allows you to see how much Co2 is left in your tank. All the draft beer parts are of the highest commercial grade quality which are designed and built to last. No Installation Required with the Economy Homebrew Party Kit. The dual gauge regulator allows you to easily measure PSI and CO2 volume and adjust CO2 output pressure using this pro series dual gauge regulator packed with premium features! The top gauge indicates output pressure, while the side gauge tells you what's left in the CO2 tank, so you don't run out of gas during a party. The chrome plated brass body has a large pressure adjustment knob for easy use and includes a manual pressure release valve. This standard kit allows you to choose between ball lock couplers to tap Cornelius Pepsi kegs or pin lock couplers to tap Coke kegs. Both sets include both a gas in and beer out coupler for easy tapping of home brew kegs. The gas in comes with a 1/4" nut and 5/16" hose barb already attached, allowing you to quickly connect it to the same size air line that standard draft beer regulators use. The beer out connector has a 3/16" hose barb that connects to standard 3/16" beer line.